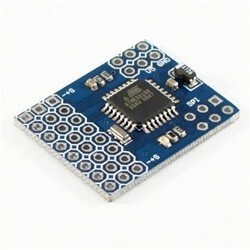 The PPM encoder v2.0 board (now with 16Mhz resonator), has an improved and smaller Paparazzi based design. The board plugs into the servo output ports on an R/C receiver and encodes them into a PPM pulse suitable for the Paparazzi autopilot and other projects. This will allow you to use any R/C equipment with the Paparazzi autopilot or read up to 8 servos with a single I/O pin of your uController. Modifications to the R/C receiver are not necessary. Connect the wires from your receivers channels to the PPM and one wire to the PPM "in" of your system. If you decide to use this board to power the receiver, make sure you put-in a jumper and plug something between the 8th channel and the receiver. 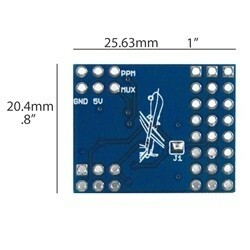 This PPM encoder is supplied without pin headers, if you need a 3x8 connector these can be found here. within interrupts so accuracy and stability is optimized. It is now also possible to select the PPM waveform shift, negative or positive. 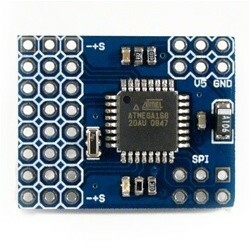 Firmware is free and was created by Hendrix and Moa, with small modifications by Jordi Munoz that allows the board to control an extra failsafe multiplexer. The original/official location of this product is located here. Important Note: The firmware comes pre-configured to read 8 Channels. In case you would like to change the settings of the PPM encoder to invert the PPM signal and change the fail safe pre-defined values you will need an AVR ISP programmer in order to reprogram it. Please note when using some Futaba radios with 8 channels and above you might experience a "very minor glitch" in operation due to clashes in the output of the TX, this is only found on some Futaba radios not all of them, any 7 channel radio and below is not effected. 8Ch inputs -PPM output (Negative or Positive selectable) -Power Supply selector (Solder jumper at bottom) -Open Source Firmware -Fully customizable -Improved PCB layout, is smaller than the original and better organized + extra programmable output.